Culinary depot Cutlery is the knife of choice for professionals and consistently receives high accolades in product testing. This "best-in-class" commercial grade cutlery is now available for home use. Victorinox knives feature high carbon, stainless steel blades, hand finished at Victorinox in Switzerland by skilled craftsmen. They provide a natural fit. A good heft and comfortable, positive grip are indications of a well-made knife. NSF approved Fibrox handles. 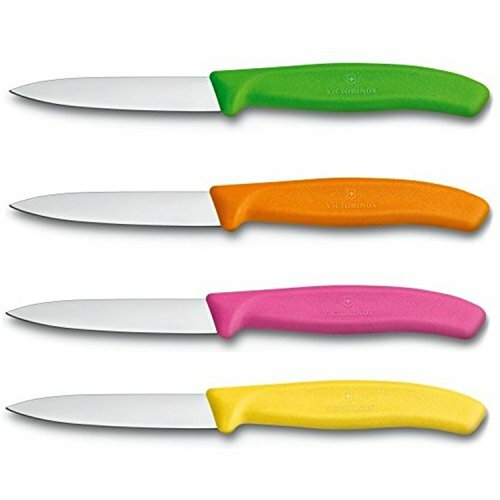 SET OF 4 SWISS ARMY VICTORINOX PAIRING KNIVES: This set includes four pairing knives whose handles are yellow, green, orange, and pink. Easy to differentiate from one another, these knives are ideal for kitchens that need to designate different knives for use with specific types of food. VERSATILE: With 3-1/4" blades, these Swiss Army Victorinox colored knives can be used to cut a wide range of items. Whether you're prepping fruits, breads, vegetables, meat, or fish, this set of knives makes it easy. Each knife has a smooth blade that excels at cutting crusts and tough skins. HIGH CARBON STAINLESS STEEL: Designed for long-term durability, these knives are made with strong stainless steel blades. Compared to typical knives, Victorinox models last up to 60% longer. Straight edge blades and spear point ends enable the knives to make precise cuts that minimize food waste and maximize meal size. COMFORTABLE GRIP: Each knife included in this set of 4 features a comfortable, ergonomic handle that is slip-resistant and constructed of polypropylene. Making it easy for chefs to use the knives for prolonged periods of time, the handles help prevent fatigue during your foodservices' busiest hours. FOR HOME OR COMMERCIAL USE: Capable of mincing, paring, peeling, and cutting, these Swiss Army Victorinox pairing knives are for both professional chefs and at-home cooks. No matter what your skill level is, the knives are easy-to-use. They are also conveniently compact and simple to store while not in use. Dishwasher safe, the knives have less of a chance to rust if washed by hand.